Since the conception of the three month break, summertime has always belonged to children: no more school, no more books, no more teachers, dirty looks (and all that jazz). It is summer, after all, that offers swimming pools, ice cream trucks, and bicycle races. But, for those of us who have outgrown the slip n slide, summer - or rather the enjoyment of - doesn t need to be a thing of the past. Thanks to Colorado wine events, summer is now a 21 and over event. Colorado wine events have opened up doors in the Rocky Mountains: this state is no longer one consumed with winter. It will no longer sit by idly waxing its skis and counting the moments till the first snowflake emerges. Instead, it will pull out a glass, pop off a cork, and engage its senses. The Colorado Mountain WineFest: Taking place in Palisade from September 17th to September 20th, the Colorado Mountain Winefest provides visitors with the chance to enjoy wine, atmosphere, and culture all in the name of a good cause. With all funds donated toward the improvement of Colorado winemaking, the Colorado Mountain Winefest provides its guests with workshops, tastings, tours, grape stomps, chef demonstrations, bicycle vineyard tours and a vat full of other activities. 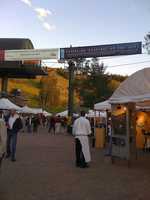 The Wine Festival at Steamboat: The Wine Festival at Steamboat takes place at - wait for it - Steamboat, Colorado. From July 30th to August 2nd, wine enthusiasts of all levels are invited to come see the regions finest winemakers and culinary artists in action. Nearly 800 wines are featured in this annual event. The food will also be vast, giving you both a taste, and sip, of Steamboat Springs. This is one of the most popular Colorado wine events in the state. Mesa Verde Country Wine and Art Festival: Mesa Verde has always been a landmark in Colorado for its cultural and historical significance. Now, thanks to the Mesa Verde County Wine and Art Festival, it is becoming known also as a place for fine wine, fine food, and exquisite art. This festival features food from local restaurants and regional vendors, and includes beef, elk, and veggie platters as well as olive oils, cheeses, dipping sauces, and salsas available for purchase. This festival takes place in Cortez from August 21st to August 23rd. Castle Rock WineFest: Castle Rock rocks wine on July 25th. Chosen specifically by the state wine boards as a place to host Colorado wine events, this locale will feature wines from small, often family owned vineyards. The wines featured are vast, ranging from Merlots to Rieslings. Designated driver vouchers are offered for a low fee and children under 17 are admitted free of charge. The mountains of Colorado offer plenty of summer activities, rock climbing, biking, white water rafting, to name a few. But for an experience that is new, unique, and does not require a helmet, try a Colorado wine event. Come see what the Colorado wine buzz is all about.